The absurdity that we are witnessing in the financial markets is absolutely breathtaking. 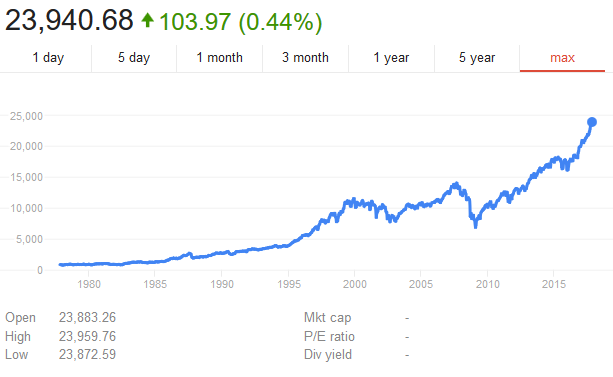 Just recently, a good friend reminded me that the Dow peaked at just above 14,000 before the last stock market crash, and stock prices were definitely over-inflated at that time. Subsequently the Dow crashed below 7,000 before rebounding, and now thanks to this week’s rally we on the threshold of Dow 24,000. When you look at a chart of the Dow Jones Industrial Average, you would be tempted to think that we must be in the greatest economic boom in American history, but the truth is that our economy has only grown by an average of just 1.33 percent over the last 10 years. Every crazy stock market bubble throughout our history has always ended badly, and this one will be no exception. Meanwhile, big tech stocks — which have propelled the market higher all year — were tanking. The Nasdaq fell more than 1%, led by big drops in Google (GOOGL, Tech30) owner Alphabet, Amazon (AMZN, Tech30), Apple (AAPL, Tech30), Facebook (FB, Tech30) and Netflix (NFLX, Tech30). Momentum darlings Nvidia (NVDA, Tech30) and PayPal (PYPL, Tech30) and red hot gaming stocks Electronic Arts (EA, Tech30) and Activision Blizzard (ATVI, Tech30) plunged too. They have been some of the market’s top stocks throughout most of 2017. “It has seldom been the case that equities, bonds and credit have been similarly expensive at the same time, only in the Roaring ’20s and the Golden ’50s,” Goldman Sachs International strategists including Christian Mueller-Glissman wrote in a note this week. “All good things must come to an end” and “there will be a bear market, eventually” they said. As central banks cut back their quantitative easing, pushing up the premiums investors demand to hold longer-dated bonds, returns are “likely to be lower across assets” over the medium term, the analysts said. A second, less likely, scenario would involve “fast pain.” Stock and bond valuations would both get hit, with the mix depending on whether the trigger involved a negative growth shock, or a growth shock alongside an inflation pick-up. Nobody believes that this crazy stock market party can go on forever. These days, the real debate seems to be between those that are convinced that the markets will crash violently and those that believe that a “soft landing” can be achieved. Vanguard’s chief economist Joe Davis said investors need to be prepared for a significant downturn in the stock market, which is now at a 70 percent chance of crashing. That chance is significantly higher than it has been over the past 60 years. Stock market leverage is the big accelerator on the way up. Leverage supplies liquidity that has been freshly created by the lender. This isn’t money moving from one asset to another. This is money that is being created to be plowed into stocks. 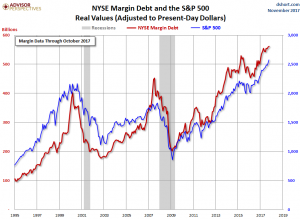 And when stocks sink, leverage becomes the big accelerator on the way down. Markets tend to go down much faster than they go up, and I have a feeling that when this market crashes it is going to happen very, very rapidly. The only reason stock prices ever got this high in the first place was due to unprecedented intervention by global central banks. They created trillions of dollars out of thin air and plowed those funds directly into the financial markets, and of course that was going to inflate asset prices. But now global central banks are putting on the brakes simultaneously, and this has got to be one of the greatest sell signals that we have ever witnessed in modern financial history. Federal Reserve Chair Janet Yellen said the central bank is concerned with growth get out of hand and thus is committed to continuing to raise rates in a gradual manner. “We don’t want to cause a boom-bust condition in the economy,” Yellen told Congress in her semiannual testimony Wednesday. While Yellen did not specifically commit to a December rate hike, her comments indicated that her views have not changed with her desire for the central bank to continue normalizing policy after years of historically high accommodation. I never thought that this stock market bubble would get this large. We are way, way overdue for a financial correction, but right now we are in a party that never seems to end. But end it will, and when that happens the pain that will be experienced on Wall Street will be unlike anything that we have ever seen before.